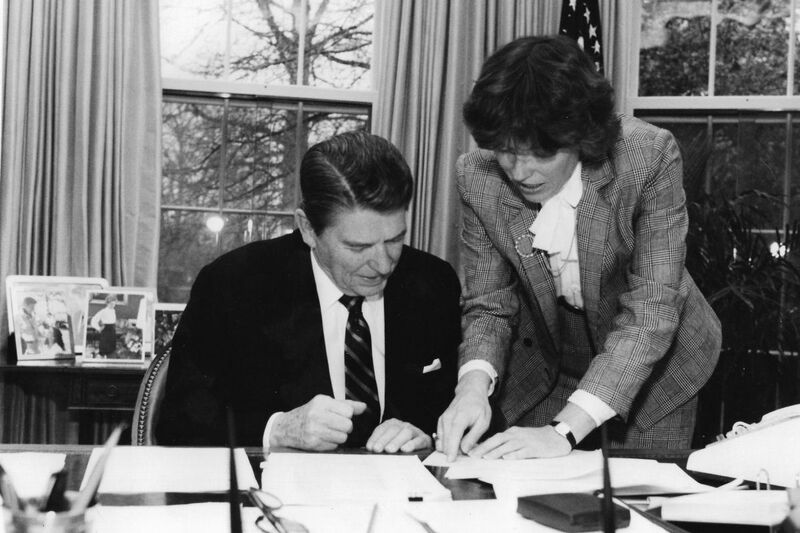 Faith Ryan Whittlesey conferring with President Reagan in the Oval Office in the 1980s. Faith Ryan Whittlesey, 79, a former top aide in the Reagan White House and two-time U.S. ambassador to Switzerland, died Monday, May 21, of cancer at her home in Washington. Mrs. Whittlesey, who earlier lived in the Philadelphia area and maintained homes in Delray Beach, Fla., and the nation's capital, was a powerful, charismatic figure and an early supporter of Ronald Reagan as the Republican candidate for president. A delegate to the 1980 Republican Party's presidential convention, she helped deliver the crucial Southeastern Pennsylvania vote that helped him win. She adopted Reagan's less-government-is-more conservatism and helped establish that tenet as a core value of the national Republican Party. As a reward for her support, Reagan nominated her as ambassador to Switzerland from 1981 to 1983 and from 1985 to 1988. She hosted Reagan and Soviet General Secretary Mikhail Gorbachev during the Geneva Summit of November 1985. "Faith was a very popular ambassador," said family friend and spokesperson Alexandra V. Preate. "She served two terms in Switzerland, developed deep friendships, and shrewdly articulated American positions." Another friend, Lawrence Stratton, associate professor of ethics and constitutional law at Waynesburg University, called Mrs. Whittlesey "a model of diplomacy and grace who also was willing to take definitive positions regarding American foreign policy, tax policy, regulation, and her passion for pro-life causes." Her time as ambassador, however, was not without controversy. In 1986, the Justice Department investigated possible misuse of funds by the U.S. embassy in Switzerland after reporters raised questions about whether Mrs. Whittlesey had misspent money from an $80,000 entertainment fund raised from private donors. The money was intended to entertain citizens of the host country. She was cleared of any wrongdoing, but in 1987 the State Department ended the practice of ambassadors' soliciting and accepting the private donations. It has since been partially restored. From 1983 to 1985, Mrs. Whittlesey was Reagan's presidential assistant for public liaison, a senior staff post, making her among the most powerful women in the White House. She had a "distinct voice in defining and executing" Reagan's agenda, Preate said. Her time in the White House also yielded controversy after news reports linked her to the Iran-contra affair. In March 1987, she was questioned by a House Foreign Affairs subcommittee about two phone calls from Lt. Col. Oliver L. North. She testified that the calls were personal. North was instrumental in the diversion of profits from U.S. arms sales to Iran to the contras through secret Swiss accounts, and in the effort to raise private money for Nicaraguan rebels. "I was in no way involved with any efforts to raise money for the Nicaraguan resistance, either directly or indirectly," Whittlesey told the panel. "I had no knowledge of it and no involvement with it." The matter was then dropped. Following her second tour in Switzerland, Mrs. Whittlesey became president of the American Swiss Foundation in New York, a position she held until 2008. Her proudest accomplishment was creating the annual Young Leaders Conference Program in which aspiring U.S. leaders spend a week in Switzerland conferring with their Swiss counterparts. The program began in 1990 and continued for 28 sessions, with Mrs. Whittlesey attending each session. Currently, there are 1,200 alumni. "The conference program bore the unmistakable stamp of her knowledge, wisdom, and understanding," said Patricia Schramm, the foundation's president. Born in 1939 in Jersey City, N.J., she was the daughter of a World War II factory worker-mother and a railroad billing clerk. The family moved to the Buffalo, N.Y., area, where she graduated from public schools. She received a scholarship to attend Wells College in central New York state and graduated with honors. Although a gifted classical pianist, she opted for a career in the law. In 1964, she earned a degree from the University of Pennsylvania Law School. In Philadelphia, she married Roger Whittlesey, an advertising executive active in Republican politics. She served as an assistant district attorney for Philadelphia under Arlen Specter, who later became a U.S. senator. When Mrs. Whittlesey decided to run for public office, she and her husband moved to the Philadelphia suburbs, where the GOP had a voter-registration edge. She ran as a Republican for a state representative seat from Haverford, Delaware County, in 1972. She won and was reelected in 1974. Charles R. Gerow, a leading Republican communications professional and a 45-year friend of Mrs. Whittlesey's, said her life had difficult patches. Her husband, who struggled with depression, took his own life in 1974, leaving Mrs. Whittlesey, then 35, a widow with three young children. In 2012, her eldest son, Henry C., also died by his own hand. "Her life was not a charmed life," Gerow said. "She had serious struggles, and she met them with courage and conviction." In 1975, she left Harrisburg and successfully challenged the entrenched "War Board," the powerful group of Republican politicians who had run Delaware County since the 1950s. In an upset, she was elected to a seat on the County Council. She served until 1979. "I remember going door-to-door campaigning with Faith when she was seven months pregnant and being in awe of her determined spirit," said her friend Mary Tatnall. Her 2012 memoir, Backwards, in High Heels, was written by Thomas Carty. Though many regarded her as "a hard-nosed fighter who never backed down," her son William W. Whittlesey, a teacher, said he experienced her differently. "She was gentle and kind, nurturing, and always available to us, even if that meant interrupting meetings with some of the most powerful people in the world," he said. In addition to her son, she is survived by daughter Amy Whittlesey O'Neill; 10 grandchildren; and a brother. A memorial service will be held at 11 a.m. Wednesday, May 30, at St. Thomas Apostle Catholic Church, 2665 Woodley Rd. NW, Washington, D.C. 20008. Burial is private. Condolences and remembrances may be addressed to: friendsoffaithwhittlesey@gmail.com.